With a cast made up by Jack Lemmon, Al Pacino, Alec Baldwin, Kevin Spacey, Ed Harris and Alan Arkin, there is little that can go wrong. Adapted from a play of the same name, Glengarry Glen Ross feels very much like a theatrical piece, limited to a handful of sets and driven by characters with large personalities, the kind that make for perfect salesmen and convincing theater actors. Among the performances, which are all of the highest quality, Jack Lemmon delivers the film’s best as Shelley Levene. He combines the largesse and charisma of a real state salesman that is desperate to close deals, and the stress of a man who must continue to provide for his family. Of the group, Shelley is also the most complex character, defined not just by greed and competition, but by an underlying sense of responsibility to his family that drives him over the edge. His eyes are not only filled with frustration and fear, but they are also filled with sadness, as if his life depended exclusively on his professional success. Without a single woman to counterbalance these men on screen, the film exudes manliness. Though there is plenty of comradery, these group of salesmen are sharks, looking after their own interests and willing to bend a rule or two to come out on top. As much as it is about their livelihoods, the struggle they face within a 24-hour period is also about their manhood. Can they demonstrate they still got it? Which one will be the man’s man at the end of the day? In this age of Wall Street and unbridled capitalism, the film is a sobering take on a microcosm of society that is exclusively driven by money. These salesmen, who are all very different people, behave as extensions of their bank accounts, measured as men by the amount of deals they have been able to close. 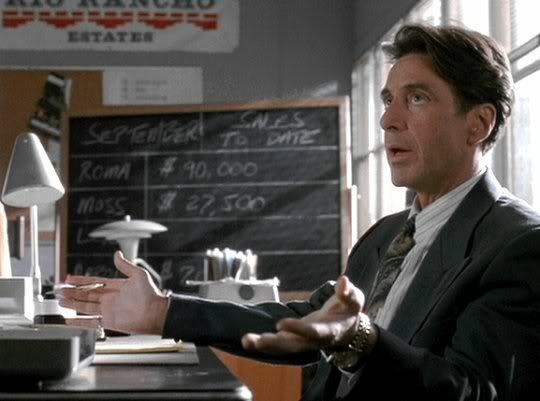 Glengarry Glen Ross is perhaps the best film that has ever been made about real estate salesmen, and one of the best displays by an ensemble of actors ever put on the big screen. Love this film. Might even have my favorite screenplay. Completely agree about Jack Lemmon being the highlight here — his performance even inspired the hilarious Simpsons character, Gil Gunderson. I had no idea about Gil being inspired by Lemmon’s character. Interesting. Excellent review, it makes me want to see the film again. Thanks. Nice to see a new visitor here. Stunning movie with amazing performances….the Alec Baldwin speech to me is his best performance, i was really impressed when I saw that. 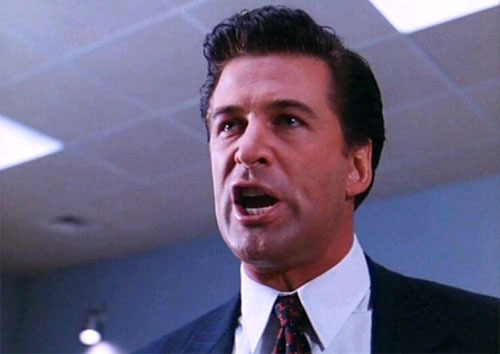 It doesn’t get much better than the speech by Alec Baldwin. I think we see some of that in his small role in The Departed. Perhaps Scorsese was paying a little homage to his famous solo. Nice review here. A great ensemble with one of the best scripts of all time. I love the hell out of this film’s venom. My esteem for this film grows everyday. At first I thought I would give it a 3.5/5, then I gave it a 4/5, and now I’m leaning towards a 4.5/5. Excellent script and great performances.